Many financial experts agree that most people should build an emergency fund. You never know what sort of curveballs life will throw your way, but keeping six months or more of living expenses in your savings account gives you a firewall against financial emergencies — whether it’s losing your job or discovering you need a new transmission. Still, despite this, a recent GOBankingRates survey found that some 55 percent of Americans haven’t stashed away funds to pay six months of living expenses in case the worst should happen. That’s why GOBankingRates conducted a poll to determine the top reasons Americans spend their emergency funds. The results demonstrate the reasons people are using emergency funds aren’t for frivolous purchases. Instead, the money saved is used for major expenses that can pop up unexpectedly and disrupt your life if you aren’t prepared for them, like car repairs or medical bills. Keep reading to find out which emergencies Americans use their savings for, and what alternatives you can use if your emergency fund falls short. The answers show that Americans have experienced a range of short-term, unexpected needs that have forced them to tap their emergency funds. In both cases, a house and a car are more than just property; they’re an important part of your life and prone to unexpected expenses that can be crippling without a financial cushion in place. Worse, the typical problems that develop can create additional problems and thereby expenses, if they aren’t addressed in a timely fashion. Without the emergency savings to cover those costs, you might find yourself overlooking important repairs long enough that the cost to fix them increases exponentially. 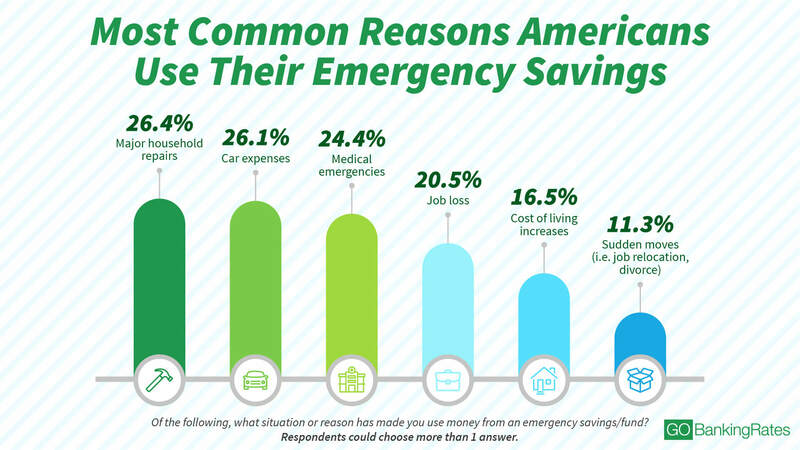 Medical emergencies were the third-most common reason for dipping into emergency savings at 24.4 percent. Medical costs have been on the rise nationwide in recent years, according to the National Conference of State Legislatures. That said, medical bills aren’t usually top of mind when people stash money away for emergencies. Survey respondents, however, might be overlooking another option that could help them cover these types of unexpected expenses: personal loans. Instead of tapping into emergency funds, taking out a personal loan could be a more viable and simple option — especially if you have good credit and a strong financial history. Personal loans typically have fixed-interest rates and flexible terms and loan amounts, and some even have $0 in fees. These features add up to having a loan with a predictable monthly payment that fits your budget. “Many consumers choose a Discover Personal Loan for home repairs as the product gives people a lot of freedom and doesn’t require collateral. Whether it’s picking the loan amount and repayment term or just being able to get funds quickly to make your repair happen,” said Dan Matysik, vice president of Discover Personal Loans. The responses among different ages demonstrate how life stages impact emergency fund usage, according to the survey. 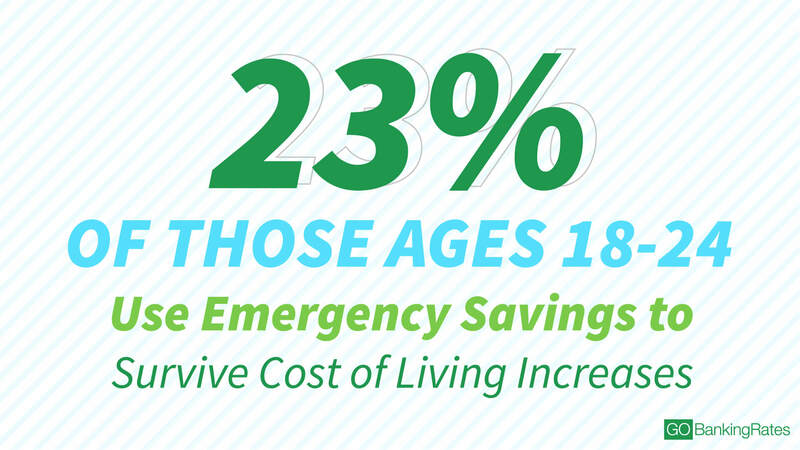 In fact, 23 percent of respondents ages 18 to 24 said they used their emergency savings for cost-of-living increases. Older age groups surveyed had lower percentages allocated toward living costs, from only 16.1 percent of those ages 35 to 44 to under 15 percent of those ages 45 to 64. The inverse trend is true when it comes to paying for home repairs. Homeownership becomes more common with age, and the results seem to confirm this. Using emergency funds for major household repairs is more common among the older respondents. The 35-to-44 age bracket had 24.2 percent of respondents say they used their savings for home repairs, increasing to 30.9 percent and 30.8 percent for respondents ages 45 to 54 and 55 to 64, respectively, and 34.1 percent of those ages 65 and older. Like homeownership, medical emergencies also tend to become more common the older you get, and the poll results are consistent with that trend. However, the trend is less pronounced. Among those ages 18 to 24, 23.2 percent responded that they used their savings for a medical emergency, increasing to 27.3 percent of those ages 65 and older. One category remained incredibly consistent across every age group, though: car repairs. Responses for car expenses ranged from 24.6 to 29.1 percent of answers across all age groups. The purpose of an emergency fund is to prepare you for the unexpected, so you can never say with certainty when you will need to tap into those funds. However, your emergency fund is a last line of defense, and if you end up spending it on short-term expenses, you could find yourself facing financial obstacles when more severe emergencies occur. That’s why it’s important to put serious thought into what you should address immediately and what you can pay for over time. If a repair doesn’t require immediate fixing, you might be able to adjust your monthly or weekly budget to find a solution rather than drain your emergency fund. Similarly, if taking public transportation to work means you can fold auto repairs into your normal budget rather than use your emergency savings, that might be a better option. It’s important you define “need” realistically. An enormous hole in your roof is precisely what your emergency fund is for — but remodeling your kitchen might not be. A personal loan can help you tackle major home or auto repairs or unexpected medical costs while keeping your emergency fund intact. Personal loans offer fairly quick access to funds in an emergency — sometimes lenders can send funds in a matter of days. No collateral is needed and monthly payments amounts can be fixed, making repayment clear and simple. Discover Personal Loans offers these features along with zero origination fees. A personal loan might be a smart choice to tackle the unexpected while keeping yourself protected from whatever else might come next. A 2017 survey conducted by Discover Personal Loans revealed that over one-third (38 percent) of respondents have taken out a personal loan in the past. Among those respondents, 68 percent said that doing so helped them accomplish their financial goals. An additional 70 percent said personal loans have made them feel financially responsible. Discover, in particular, offers personal loans ranging from $2,500 to $35,000 — which is more than what many people have in savings, according to GOBankingRates’ annual savings survey. If you have an emergency expense in excess of what your savings can cover, securing a Discover personal loan might allow you to meet your immediate financial needs without wiping out that all-important financial backstop. Additionally, Discover Personal Loans lets you check your interest rate on a personal loan with no impact to your credit, all before accepting the terms of the loan. Remember that an emergency fund is a safety net. You might never need it — but if you do, it will prove invaluable. So when there are better options — like investing in insurance, scheduling repairs or even taking out a personal loan at the right rate — it’s usually worth taking steps to ensure that your emergency savings remain untouched. Keep reading for more tips on how to build your emergency fund. Methodology: This survey was conducted as a Google Consumer Survey and collected responses from 5,046 people. The survey posed the question, “Of the following, what situation or reason has made you use money from an emergency savings/fund?” with the option to select one or more of the following answer choices: 1) major household repairs, 2) car expenses, 3) medical emergencies, 4) job loss, 5) cost-of-living increases and 6) sudden moves (e.g. job relocation or divorce). The findings are representative of the U.S. online population with a margin of error of 4.4 percent. This survey ran and collected responses from Feb. 22, 2018, to Feb. 24, 2018.